eClinic Systems is a category of healthcare software that deals with the day-to-day operations of a medical practitioner. eCS software frequently allows users to capture patient demographics, schedule appointments, maintain lists of insurance payers, perform billing tasks, and generate reports. eClinic systems are designed for small to medium-sized medical offices and designed for or used by third-party medical billing companies. 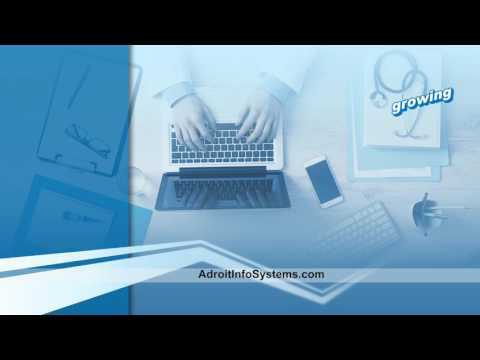 Adroit Infosystems Pvt. Ltd. is a fast-growing Healthcare Product Development and IT Services company providing full-spectrum software product development services to enterprises worldwide. Headquartered in US, Adroit Infosystems has a state-of-the-art offshore Development Center in noida,delhi NCR, and India. The capture of patient demographics often starts when a new patient fills out a patient information chart. This information includes the patient's name, address and contact information, birthdate, employer, and insurance information. Practice staff typically enter this information into the software. The software may automatically verify the patient's eligibility for receiving benefits with the insurance company using a standard electronic data interchange connection. systems often include a calendaring or scheduling component that allows staff to create and track upcoming patient visits. Software is often differentiated by whether it allows double-booking, or whether it uses a scheduling or a booking model. Schedules are often color-coded to allow healthcare providers (i.e. doctors, nurses, assistants) to easily identify blocks of time or sets of patients. In cases where a patient did not have proper insurance, or where insurance coverage did not fully pay the charges, the eclinic will usually send out patient statements. eClinic Systems software often contains a way for a practice to print and mail their own statements (or other correspondence), and may even contain a way to interface to third-party patient statement printing companies. Almost invariably, the process of running a medical practice requires some introspection, and eClinic software usually contains reporting capabilities to allow users to extract detailed data on financial performance and patient financial histories. eClinic often has both pre-setup reports as well as allow users to design their own, ad-hoc reports. In some cases, the reporting functionality of eCS interfaces with Decision support systems or has similar functionality built-in.